The insightful report that I read today on how students background affects the performance made me think about my own life. "Wealthy families do not worry about food, or transportation, or whether walking to school involves crossing a gang boundary. If you haven't lived in poverty, it is hard to imagine it. They have shelter, and health care when they need it. If a crisis hits, they have savings to fall back on – or at least access to credit on reasonable terms." Another opposite view on how the children of affluent people get trapped in the world of entitlement. "Want to know what keeps the owners of the most successful family businesses up at night? The dread that their kids will grow up to be entitled." But, I've studied with them, shared food with them, played tag and grew up with them. Many that I knew failed because they never had the right opportunity or money. Few never rose up in their life because they were trapped on the wrong side of the streets. Few certainly succeeded through hard work and willpower. I have never seen poverty in my life or prepared for exams studying under the street lights. I always had a shelter with the comfort of loving & caring parents. I always had access to clean clothes, safe home and toilets free from mosquito infestation. My parents & other elders demonstrated great values in life, I believe I'm working hard to share with my children. I have never felt entitled and every single rupee came in and spent were accounted for in my family. I always got new clothes on the occasion of Diwali and enjoyed the once-a-month sweets brought by my Dad from on his salary day. All that I knew was hard work, sincerity, respecting others, respecting my body with its organs intact and working and appreciating the one life given to me. Luck had never excited me. I never wanted to have a mind that would encourage complacency. 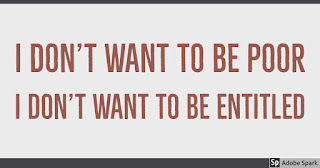 Hard work is something who I buddied with, sincerity & giving the 100% was something that my parents had gifted me. Every single cell of mine left their signature in all the tasks that I carried out. I continued to engage with more vigor if I liked them or instantly disengaged if they brought an incomplete feeling in me. I consider myself a fool if I don't learn from my experiences or from the wisdom shared by the wiser ones next to me. I'm neither poor nor that entitled. Today, I was reminded by Facebook about a post, written by me soon after first Comrades Marathon way back in 2014. Many things had happened after this experience and today I was triggered to write something about them. Any experience, however good or bad, is surely a short-lived one. I was dreaming every single day, since the day I learned about the Comrades Marathon, to go and experience it and bring home the tiny finisher medal. 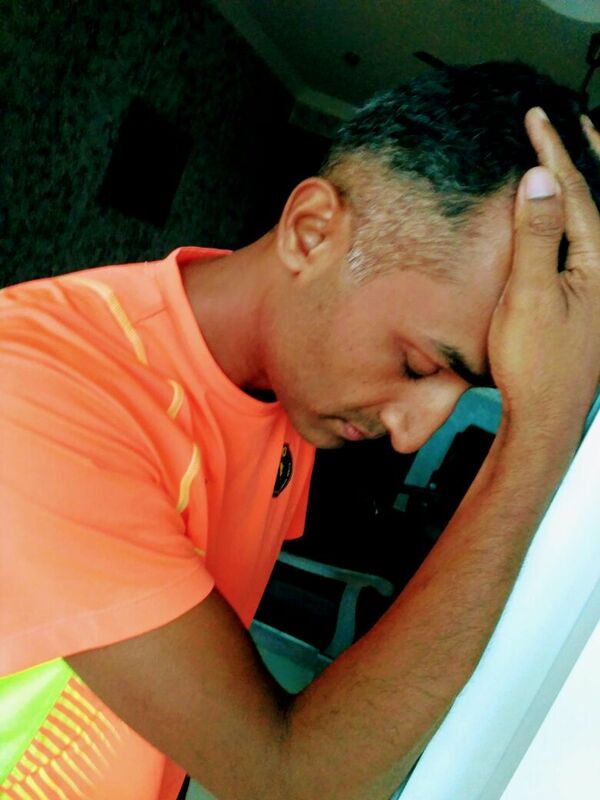 I planned for my first Comrades run for more than one year, sincerely trained the last 8 months before the race in 2014. An overtraining injury surfaced just a few days before the Big C and I soaked myself in treating it aggressively. But, the time was not with me. At the start line at Pietermaritzburg, I wasn't ready. I decided to go and run as much as I could on that day and ended up running until the halfway mark. The outcome wasn't as desired but certainly, I had to accept it and pull out of the race. I sat on a stone and decided to cheer and clap for the runners who were slowly marching towards Durban. I decided to go back and finish the Comrades a year later. I knew it was worth the wait. Not finishing the Comrades looked like a failure at that time but I actually gained something. A year later, the year 2015, I went back and completed the Up run. While approaching Drummond I saw the stone, it appeared to be smiling at me and waving its hands for my successful finish. Today, I am comfortable talking about success and facing failures after going through such experiences. I've learned that both success and failure are short-lived. It is important is to celebrate the success immediately without waiting. Should the results be not the best and/or the desired one, be patient, mentally stay stronger, take a step back, feel positive, and fix the foundation, if needed. 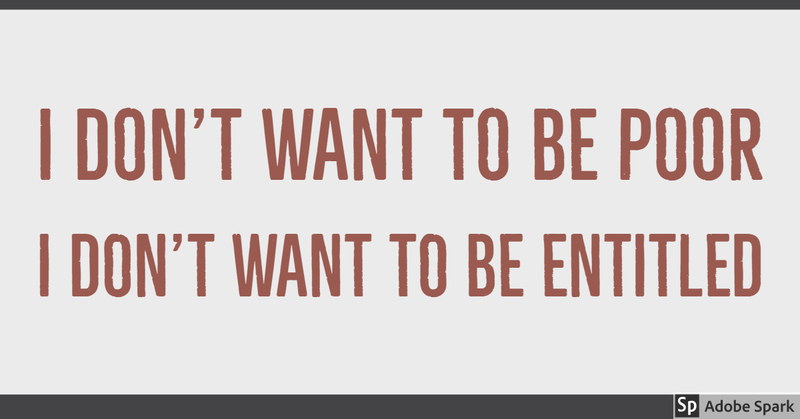 The experiences are worth experiencing, well, irrespective of their outcomes. At 4.45 am in the morning while mentally planning for a client appointment I drove my car out of my apartment. Within few minutes, I was about to get past the railway gate located very close to my home in Yelahanka. Yelahanka is in the North of Bangalore and is located in a very busy passenger and freight train corridor. Many trains arrive into Yelahanka/Bangalore city early in the morning and there are more chances to find the railway gate closed at that early hours. Luckily, the gate was open. The weather meter in my car dashboard indicated 16 deg Celsius and the early morning silence was slowly broken by my car stereo with a devotional song. I was slowly approaching the railway cross. All of sudden, I noticed a ghostly image of a woman wearing a red scarf, with torchlight in her hand and slowly walking towards the middle of the road along the railway track. I was further amused to find this ladylike figure quickly sat down in the middle of the track. "What was she trying to do?" I nearly stopped my car at a safe distance. I cut the volume and picked my phone to capture this unusual sight. Interestingly, she was a familiar figure. This lady works as a guard at the railway gate and one can often find her operating the gates. I was wondering what she was doing in the middle of the track at that hour without any fear of oncoming random traffic. She did not get up even after noticing my car headlights or another one approaching the tracks from the opposite direction. She was busy doing something on the track. That's when I noticed a brush and a tray in her hand and she was collecting something from the track. She was removing loose stones and sand deposited on the tracks. She must be very brave to do anything like that and did not move even when another vehicle approached the level-crossing and went past her with mindless honking. This lady was undeterred and was totally focussed on cleaning the track. I decided to step down from my car to talk to her about her safety. It was at the same time the another car crossed her in the opposite direction and went past my vehicle. I saw her slowly walking into her cabin. I didn't want to be late for my client's appointment and I decided to interact with her later that day. With loads of mixed emotions, I left that place. Two days later, I met this lady and spoke to her. What a surprise! she confidently spoke to me in good English. She is a graduate and lives in a nearby village. When I enquired about the safety standards and why she would risk her life, she said, Sir, it is my duty to keep the railway cross clean and also ensure the surrounding area to be clean from garbage. My primary responsibility is to make sure the railway gate is closed and opened on time. Secondly, I must keep the railway track clean otherwise I'll receive a possible suspension from my higher authorities. She did not talk much about the safety procedures that she was supposed to follow. It was obvious that she took a lot of pride in wearing the Railways uniform and it was unfortunate to note that the railways haven't provided with a (simple) 100 Rs. safety helmet or an 88 Rs. reflective jacket. 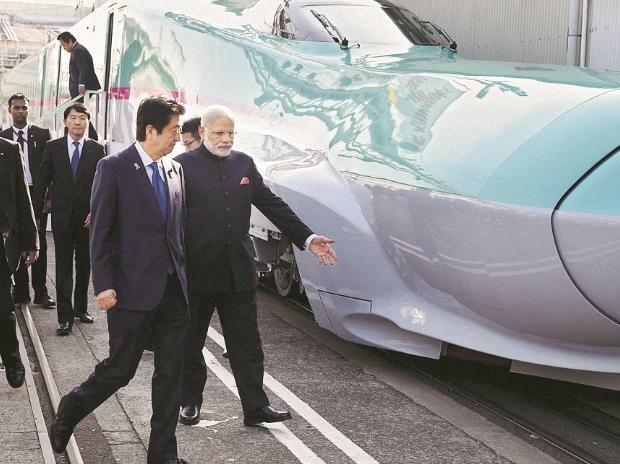 The Indian government has launched an ambitious multi-billion dollar Bullet Train project, great to know that and I'm sure such projects come with impeccable safety standards. At the same time, there are millions of kilometers of Indian Railways has thousands of such manned railway crossings and every single railway level cross has a person manning the level cross to clean the rail tracks. How can a women worker be allowed to work at 4.45 am, risking her own safety? How many times we all travel in a train and wish our journey to be a safe one? Also, there is always a lot of discussion about improving the safety of rail travelers. Who is taking care of the occupational hazards of such low-level workers who complete a vital link in providing the required safety for the passengers? Go! Secure your mask on first! How often do you dream about your favorite vacation spot? When was the last time you envied your 'carefree' days as a child you used to lead? Every day is not the same for adults. Sadly, most days have become stressful for most of us. Work, travel, family pressures, financial commitments; there are many of us busily chasing our dreams (or the dreams belonging to our bosses). On top of it, the digital addiction is haunting our lives by eating major chunks of the golden 24-hour pie each one is given to consume. For some, the time lost is in few minutes but for others, it's many hours. Should more work and stressful days relate to more money saved in the bank? Have you ever thought about the specialists, doctors, and hospitals who have reserved a bed for you to come and spend rest of your lives fighting 'something'? What gets compromised most often? Everyone sets aside time for fitness hoping to stay fit or indulge in a hobby. Unfortunately, the time is easily compromised by other priorities most often. This swiftly takes us closer to lifestyle diseases and other health-related complications or simply 'making us miss something that we love'. Taking care of oneself, thought the easiest, takes the least priority. I know many of my friends think about taking care of their health few years after solving their present life problems. Simply postponing the problems to a future date will only worsen the complications. What do all these things result into? Any day that ends up with at least one stressful incident will mess up the (7-8 hrs) quality sleep that we all deserve. It is a well-known fact that lack of rest and sleep causes a disruption in our own life the next day, the following days, the rest of the weeks and the rest of over lives. We are always trying to catch up with something and this vicious cycle goes on and on. Should you really "Live every day as if it's your last." Though this phrase is very meaningful, I would like to disagree with this. I would love to treat every single day as if I'll live more and would go to bed with a hope that there will be a beautiful tomorrow. In the end, hope is the only thing that keeps us alive. Whatever good or bad happens in a day we all must end the day gracefully, bring in positive thoughts and sleep well. Every single day our body requires the best care and rest-for-recovery routine. Quality rest and sleep is important. Period. I wanted to understand what most of us, at least the people known in my circle do to end their day. I asked this question. 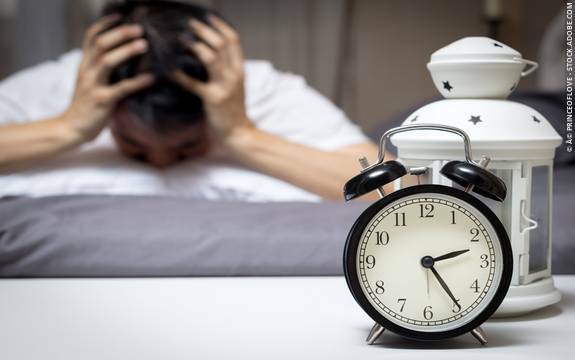 How do you go to bed every single day (let's say most of the days, write your typical retirement routine, the activities that you generally do), let's keep the time as 2 hrs before the bed? I instantly received inputs from at least 20 of them and quite interestingly, everyone seems to be following many positive routines and few others continue to have few modern-day challenges. Out of all the responses, I had extracted, what I call them as "the wisdom" from their lives and summarized them under three categories. Smile :) & thank, whoever it is, for giving you a great day! My Dad (he is no more) always wanted me to sit next to him and touch him... even if I was working. The 'touch' brought in confidence and turned him away from the loneliness. How many times you had listened to this in-flight safety announcement? "If you are traveling with a child or someone who requires assistance, secure your mask on first, and then assist the other person. Keep your mask on until a uniformed crew member advises you to remove it." "Secure your mask on first" as a metaphor, this can be very well used in our lives. Many times we miss our own aspirations and personal goals. We simply forget to be "selfish" and mostly worry a lot about taking care of others. This includes as simple as following a simple sleeping routine. This list could have been longer, shorter, and completely having different elements. We all must figure out what works the best for us to nurture our body and thoughts every single day. I've shared the collective summary of inputs openly shared by my KaysFIT Academy members and few friends. I with I could follow everything mined here. Go secure your mask on first!! Happy retiring every day! happy sleeping! You have decided to order food through a famous food delivery chain app. You chose a popular Chinese restaurant chain which has a decent customer rating. You are now looking forward to the food to arrive and to having a great family time. Here is my family's horrific experience of finding a cockroach in the food followed by the discovery of how customers are cheated by a restaurent to make some quick money. 4. Interestingly, after some time, the Delivery boy arrived at the doorstep, he delivered the food and asked for the payment. He also insisted that we pay the delivery charges. I told him that the order was placed through Zomato and he shouldn't charge for the delivery. "I didn't know it was ordered through Zomato... its ok Sir" he moved away. Also, the bill that he gave from "Beijing Hotels Pvt Ltd" and not from Zomato. 5. We started eating the food and we were having a good family time. 6. Then came a shocker when suddenly my wife screamed "cockroach"!! A "dead cockroach" was found in the "Veg Dragon Chopsey". All of us ended up puking instantly. 7. I sent a tweet to Zomato and instantly received a callback. The lady on the phone apologized and said she would deliver some other food. 8. Insisted to have the CEO of Zomato to visit us to learn the horrific story. A simple apology was not acceptable for a situation like this. 9. Later in the night, I received 2 more phone calls, presumably from Zomato, I wasn't in a mood to talk to them. 10. Today morning, came another shocker when I opened my laptop. The Zomato order screen was there right in front of me. The order status read, "Rejected". I smelled something more than a dead cockroach. 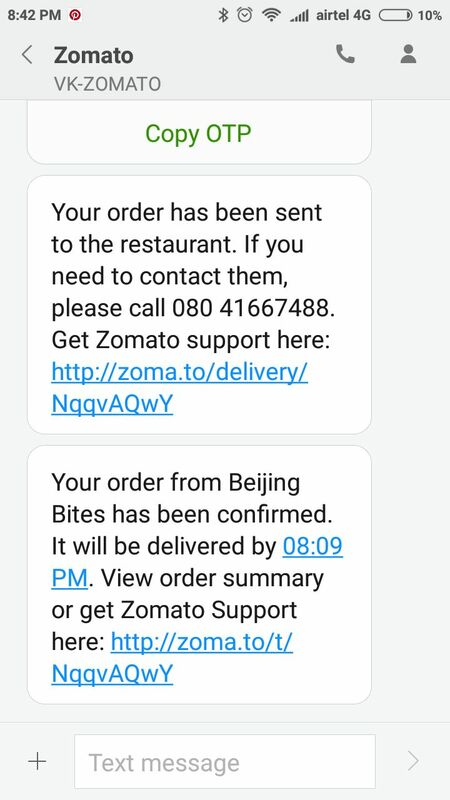 "Beijing Bites is possibly cheating both Zomato and their customers, and this is my theory." 2. They received the order details and started preparing the food. In an ideal scenario, Zomato would be notified once the food was ready and the Zomato delivery boy picks the food to deliver to the customer. Zomato gets paid a % of the order value. 1. Beijing Bites confirmed the order and after they got the order details, they canceled the order quoting they were busy. Zomato should have notified me ideally, but this did not happen. Beijing Bites is very smart here. 2. Beijing Bites then packs and sends the food directly to my home using its own delivery boy. Also adds a 50 Rs. delivery charge. By doing this, they don't have to pay anything to Zomato. 3. Usually, most customers don't get into details. Once the food arrives on time everything is perfect. How many customers would notice the 50 rupees delivery charge and question the delivery boy? Now that the cockroach and the foul play are out what should happen? Now that Zomato knows this incident, shouldn't they delist the restaurant from its directory for cheating? Whats the role of BBMP in ensuring the food and hygiene safety of restaurants are checked, monitored and also the license canceled for not ensuring food and hygiene standards? Finally, how can anyone compensate my family for going through this disgusting and horrific ordeal? Also, road accidents keep happening every single minute due to unsafe roads, reckless driving habits, drunk and driving, rash driving this list is limitless. In a post-accident environment, we always talk about the first-responder (the person who takes charge of the situation, provides first-aid and provides direction to others) and seldom talk about the other key people part of the support system like the person who takes charge of clearing the traffic, the person who takes the responsibility to call the 108 or any similar emergency number. There is no place to discuss few senseless individuals who take pictures or videos without showing any empathy to the accident victims. I'm also not going to talk about the inquisitive or the curious bystanders who believe that someone else will take care of the victim. There are many pairs of hands required to save a life and generally, the focus is diverted on only to the first-responder. Sometimes the first-responder could be just alone and he or she must have to play multiple roles. For the sake of simplicity, let's assume there is one more person available to call the Ambulance and this article is all about this person. Pre-hospital care or ALS or Advance Life Support is expected to be given to patients being transported to the nearest hospital. 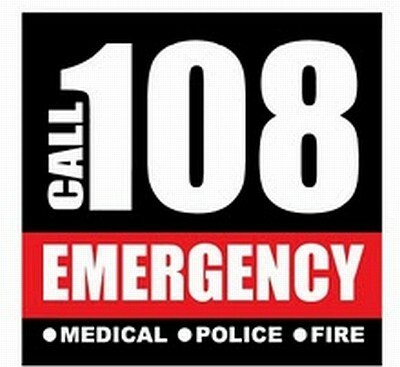 We all assume that the 108 ambulance is well equipped to handle a variety of emergency situations and comes with well trained and empathetic driver and paramedic. The service is normally free to patients. You are a vital support person to the first-responder already attending to the victim, you may act as a vital support person and listen to his/her instructions. Understand very clearly what kind of first aid from the Advanced Life Support (or ambulance) is required. Sometimes AED (Automated External Defibrillator) equipment may be required and you may want to communicate that when you call the emergency room. I don't know if 108 provides AED - this must be validated. Do not panic: Stay calm and move away from busy traffic or noisy area to ensure the emergency room operator can hear you clearly. Quickly gather knowledge to guide: assess the nature of the accident and the victims condition, the location of the accident (good idea about the geography and the access roads to give directions to the ambulance driver), what type of emergency situation and how many people are affected. More than one ambulance may be required in some of the nasty accidents involving multiple people. Communicate confidently and clearly: You play a very crucial role as a caller who will connect the emergency services team with the accident team in getting the best and quickest assistance during the Golden Hour period. Assist the first-responder after the call: Once the call is completed - you may assist the first-responder or control the crowd or even the traffic (you can shout and ask them to move away or give way to the ambulance arriving) or assist in handling the victim. Airtel India's excellent customer service! It started when I was worried about not receiving SMS messages from a two-factor website authentication login page. I called Airtel 121 and after struggling through the IVR navigation options finally, I got through to the option to talk to a customer service executive. The IVR system prompted me with the message "this call may be recorded...." I was a bit more worried about the quality of my interactions with the customer service executive. I had decided to communicate well. Me: "I'm still not receiving messages and I'm obviously WORRIED about that, how can you ask me not to worry about this, why I'm not receiving those messages?" Airtel: "Mr. Kannan, there is some technical issue and I've raised a complaint, DON'T WORRY about it"
Airtel: "DON'T WORRY Mr. Kannan, your problem will be rectified in 24 hrs"
at this time he promptly responded and said the DND services had nothing to do with the problem that I was facing. Me: grrrrrrrrrrr..... "you just said 24 hrs...."
then started seriously WORRYING about how I managed to screw up my Sunday evening. God Save Airtel India and its not yet so worried customers! Am I just alone and special who received this fantastic treatment? Are you not on Airtel? are you not WORRIED about it? Kannan (Kay) Sundararajan. Simple theme. Powered by Blogger.